After a somewhat eventful few days, I finally got to the grocery store yesterday. It was my last thing to do before I got to go home and collapse. When I, at last, got home, I sat down, got comfy and started reading the paper. In the editorial section was a letter to the editor complaining about how the crossword puzzle was placed not above or below the fold, but on the fold. This is unacceptable, please never do it again. Unfortunately, Mr. R, as much as I’d like to get on the bandwagon with you, my husband had an actual, real-life heart attack the other night. Not cool. Talk about unacceptable. However, I would like thank you for the comic relief you provided for me and my girls after I read your letter to them. We got a good chuckle out of it—a shared sense of relief, if you will. I have to admit Mr. R., we did mock you a teeny, tiny bit. I have to also admit that I’m not at all ashamed that I teach them to do that. Anywayyyy, just in case you’re wondering, after a pretty close call, Husband is doing better and back home again already. There’s some residual damage, but that can heal. I will likely write about the whole heart attack thing some other time, but for now I wanted to show you a little something I noticed. 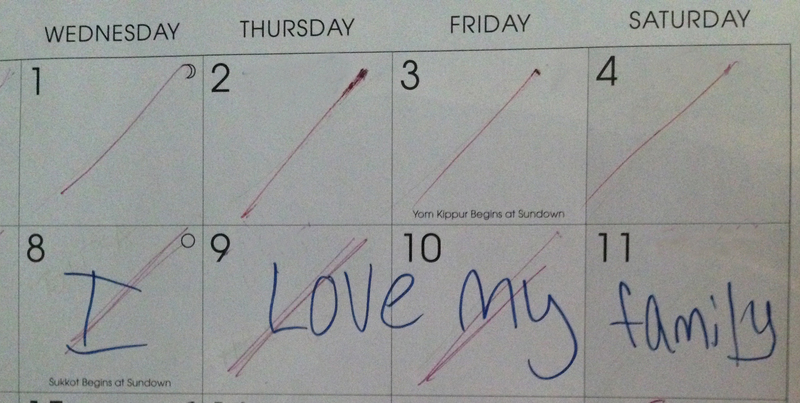 Our youngest wrote this on the calendar two or three weeks ago. Aww, isn’t that nice? She really is sweet that one. What I suddenly realized as I looked at it is, Wednesday the eighth is the day I had to take Husband to the ER. Saturday the 11th is the day he came home. What are the chances? I mean really. What are the chances that she would write those words on the exact days we had to go through all that? Two or three weeks before it happened? Those days were covered with love before they came to be. How cool is that? Really puts things in perspective! Thank you so much. I have no doubt that everyone’s prayers have kept a lot of fear at bay for me. You folks down South have sure been a blessing to our family too.